Join VEBA volunteers for a day of service at the University of Virginia School of Law. This is our first clinic serving the Piedmont so we expect a large turnout of individuals in need of assistance. The CLE and clinic will take place in the Purcell Reading Room in Slaughter Hall. CLE will be offered from 1-3 p.m., with 2 hours of Virginia MCLE credit expected. For attorneys participating in the clinic from 3:30-7, the CLE is free. Please note that because we have to have enough attorneys to supervise all law students, the number of law students we can accept is limited by the number of attorney registrations. Excess law student registrations will be cancelled by reverse order of registration, such that the last law student to register is the first whose registration will be cancelled. Notice of registration cancellations will occur 48 hours prior to the start of the clinic or as soon as possible. 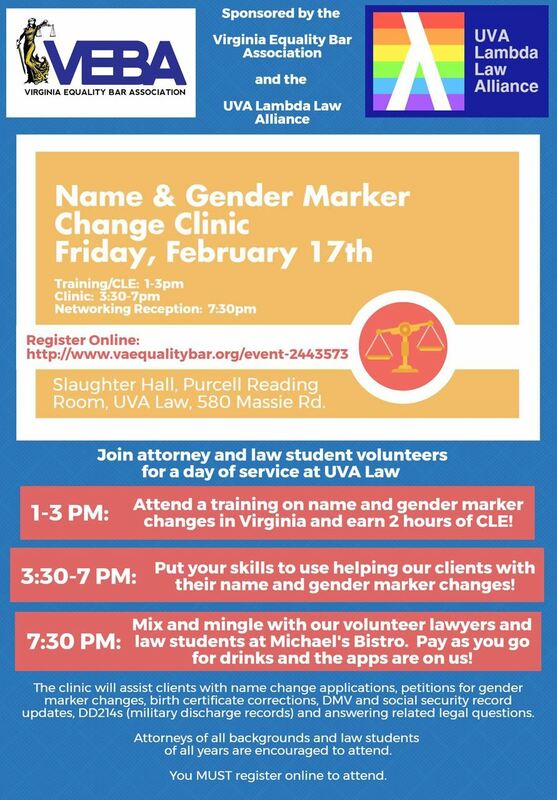 This event is co-sponsored by Lambda Law at the University of Virginia School of Law.